Draft. . . . . . . . . . . . . . . . . . . .
Pilothouse headroom. . . . . .
Displacement w/half fuel. . .
Cruising speed. . . . . . . . . . . . 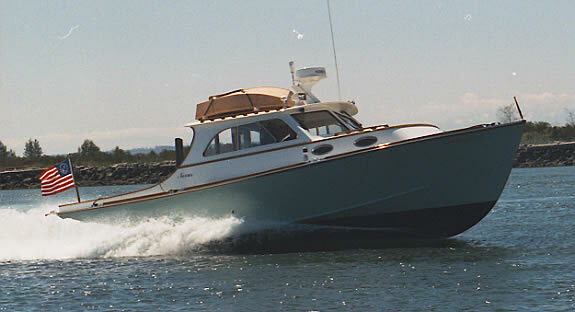 This custom wooden single Diesel powerboat displays the running trim of her lobster boat heritage. She's making about 30 knots in this photo. The job of a custom boatshop is to make dreams come true. Virtually all of our boats are built for experienced owners with great ideas. This yacht is no exception. This may be the ultimate cruising boat for one or two couples. Designed for Puget Sound waters, this Diesel powered vessel keeps her owners warm and dry in any weather in the enclosed pilothouse. She handles beautifully with her bow thruster, making life easy. Great visibility and lots of cabin heat ensures fun trips in any weather. Her traditional East Coast appearance and elegance will turn heads everywhere you travel. The 34' Odyssey construction follows the finest yacht standards. She is built of cold-molded, epoxy saturated African mahogany plywood that was custom made for us in Greece. The framing is African mahogany and clear fir. This construction method creates a light, fast boat that will be economical to run. The epoxy saturation technique, or WEST SYSTEM®, means less maintenance than a fiberglass hull. We selected a modified lobster boat hull form for both seaworthiness and speed. The shapely hull features a sharp entry, full flaring bow, and a varnished tumblehome transom. A cutaway skeg and strut with airfoil sections deliver a smooth water flow to the prop. This efficient arrangement protects the prop from debris. To create a quiet boat, we selected an aft engine placement with a V-drive. Benefits include an excellent shaft angle, perfect balance, and top performance. Before starting construction, we built a 1/8 scale, radio-controlled model to test this new design, and tune the dynamic interaction of the prop, skeg, and rudder. Paired with the deep airfoil rudder, the airfoil skeg produces a powerful turning moment at high speed, yet its area is just right to allow the boat to bank its turns. The boat tracks straight in all conditions. The long shallow skeg extending to the bow assists with low speed handling. Finally, the bow thruster allows you to dock and undock with ease. This single engined 34' design cruises at speeds from 20 to 30 knots. The hull is very stable, yet cuts through a sharp inshore chop quietly and smoothly. The paneled mahogany interior recalls a fine mega-yacht, complete with teak soles throughout. The spacious cockpit is self-bailing, has ample storage, and sports a removable table for entertaining. The warm pilothouse contains a dinette that can seat four facing forward, or facing each other in a standard dinette configuration. As an added benefit, the dinette makes into a second double berth. Across from the dinette, the galley allows whoever is cooking to stay with the rest of the crew in the light and airy pilothouse. Inside steering keeps everyone together and dry. Down below, the head compartment faces a storage locker and an electronics locker. Up forward you'll find a spacious double berth, complete with a separate door for privacy when guests are aboard. And its beauty warms your heart. The first vessel of this design has been delivered and is giving pleasure to its owners. We welcome visits to the Nexus shop. Call and arrange one, and see if this boat, or perhaps another of our designs, suits your needs. Or bring your dreams, and we'll bring them to life.